Learning to use my body better as I move through the day has helped me practice and perform with greater freedom. I have also found the Alexander Technique helpful in a variety of activities , from working at my computer to brushing my teeth. If you read enough books about dressage, you’ll eventually bump into recommendations for the Alexander Technique as a means to enhance the use of your body and posture in helping your horse recapture its natural balance and way of going under the weight of the rider. In my case, I not only wanted to improve my equitation, but also to release and reverse years of habitual misuse of my body due to a mild scoliosis and its attendant curves. What I found in practicing this technique with Phyllis was that through touch and heightened awareness, we found a way to light up the inner circuitry of my body so that I recovered lost abilities, improved my posture, and learned more normal functioning, balance and suppleness. As our sessions progressed, my capacity to ride with a more independent seat, hands, legs and back improved noticeably. I learned from Phyllis that it’s not in the doing, but in the not doing, that unlocks the subtleties of the Alexander Technique. Yesterday I took an old, heavy sofa downstairs and out to the curb. I did it by balancing the sofa on one leg, then swinging the other leg forward, like walking the sofa along. Many of my friends gave up on lifting heavy stuff because they have bad backs. Some of them have had back surgery and they are younger than I am. Because of the /Alexander Technique, I knew how to do these things without injuring myself. Learning the Alexander Technique is like learning to read: once you’ve learned to read, all forms of knowledge are accessible to you. Learning the Alexander Technique helps you remove stress from your body as you go about your daily activities. You become receptive to other forms of physical learning. You learn how to learn. I didn’t know how to learn before—I had a form of dyslexia related to body use. Now I can learn better and more easily. I am very pleased to see how much more efficient and powerful my trumpet playing has become as a result of Phyllis Richmond’s Alexander Technique instruction. We focused on how to sit and stand efficiently and even how I lift and hold the trumpet. I’ve increasingly learned “how to be” posturely to help me while on my job (as a musician), and with my other activities daily. From my session, I usually see “lightbulbs” of ideas that I can apply as I go about my life. It’s been over a week that the seminar was completed and how grateful I am that I was able to attend those 3 days and receive such wonderful benefit. Your Alexander lessons and the guidance you gave for keeping the shoulders & shoulder blades down has been prominent on my mind. I feel much more stable seated at the piano, more balanced and less anxious, increasingly free from neck and upper body tension this past week….You have helped me overcome awkwardness, discomfort, and inefficient movement and I am still in the (lifelong) process of becoming more aware and more fully integrated. Phyllis taught me how to detect when my muscles were competing against each other in something as simple as lifting my arm. I’ve been able to improve the efficiency of all my techniques, from using the kick drum on my drumset to my four mallet technique. 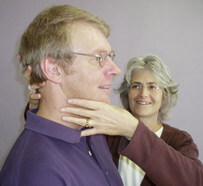 To attend an Alexander Technique class is to experience the exhilarating challenge of releasing a life-long accumulation of restrictive posturing habits that have kept me from enjoying effortless, flowing movement not only in my personal time, but especially while delivering massage therapy. Incorporating the Technique optimizes therapeutic effect for my clients and also minimizes chances of injury to myself. By learning the Technique, I am confidently expecting many years of injury-free massage therapy work. Phyllis’ invaluable hands-on coaching helps one implement the theory with a thoroughness snot possible by simply reading and viewing text material lone. The Alexander Technique has been extremely helpful in my playing and everyday life. I feel it was a time for tearing down of old unnecessary habits and building of new positive ones. My body’s been exposed to less tension, so now I recognize more tension and let it go. but until you’ve had an experience of less tension, you’ve got no frame of reference.